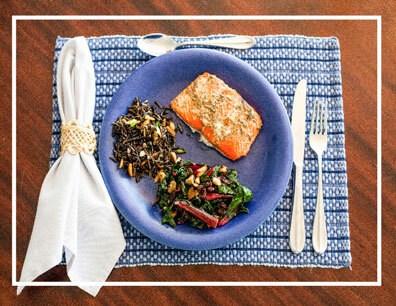 Start with wild rice. Follow cooking instructions on the package. While rice is cooking, prepare rice mix-ins: In a medium sauté pan, add butter, green onion and sliced almonds. Mix together on medium heat until green onions are soft. Once rice is cooked, add salt and butter to taste. Add green onion and sliced almonds to wild rice. Stir and set aside. Place salmon fillet in oven, coated with desired sauce (cook for 6 minutes before adding blueberry sauce), set timer for 12 minutes. Once cooked, salmon should flake easily. Do not overcook. Steam chard until slightly tender, about 5 minutes. Remove chard from heat and set aside. In a medium sauté pan, add olive oil, chopped walnuts and raisins. Cook on medium heat, add garlic when raisins begin to become round. Stir for 1 minute. Add chard to sauté. Add salt, pepper and lemon juice to taste. Stir. Stir continuously until blueberries look mushy and liquid forms. If too dry, add 1 tablespoon of water. Wait to coat salmon with blueberry sauce until salmon is half way cooked (6 minutes). In a small bowl, mix marinade with olive oil. Coat salmon with mixture and let marinade for at least 10 minutes. Place marinaded salmon in oven.